There may be many similarities between the importance of large predators in marine and terrestrial environments, researchers concluded in a recent study, which examined the interactions between wolves and elk in the United States, as well as sharks and dugongs in Australia. In each case, the major predators help control the populations of their prey, scientists said. But through what’s been called the “ecology of fear” they also affect the behavior of the prey, with ripple impacts on other aspects of the ecosystem and an ecological significance that goes far beyond these species. The study was done by scientists from Oregon State University and the University of Washington, and was published in Frontiers in Ecology and the Environment, a professional journal. “For too long we’ve looked at ecosystem functions on land and in the oceans as if they were completely separate,” said William Ripple, a professor in the Department of Forest Ecosystems at Society at OSU, and an international expert in the study of large predators such as wolves and cougars. 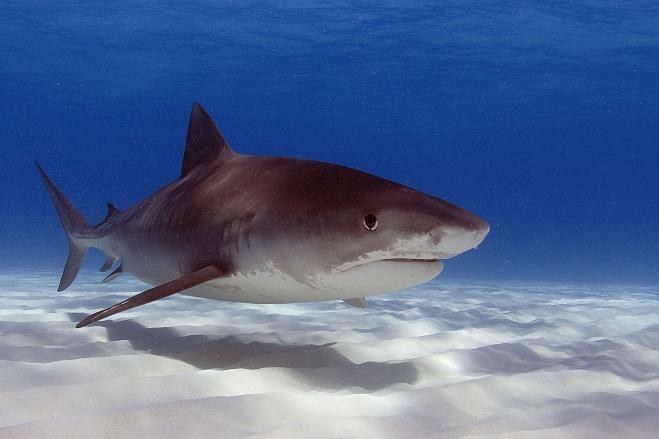 In this study, Ripple and collaborator Aaron Wirsing, a researcher with the School of Forest Resources at the University of Washington, compared what has been learned about wolf and elk interaction in Yellowstone National Park in the U.S. to the interplay of tiger sharks and dugongs in Shark Bay, Australia. Dugongs are large marine mammals, similar to manatees, that feed primarily on seagrasses and are a common prey of sharks. In studies with elk, scientists have found that the presence of wolves alters their behavior almost constantly, as they try to avoid encounters, leave room for escape and are constantly vigilant. The elk graze less in sensitive habitats, which in Yellowstone is helping streamside shrubs and aspen trees to recover, along with other positive impacts on beaver dams and wildlife. Conceptually similar activities are taking place between sharks and dugongs, the researchers found. When sharks are abundant, dugongs graze less in shallow water where they are most vulnerable to sharks, and sacrifice food they might otherwise consume. This allows the seagrass meadows to thrive, along with the range of other plant and marine animal species that depend on them. Related marine interactions have been observed in the North Atlantic Ocean, Ripple said. As shark populations were diminished by overfishing, the number of rays increased, which in turn reduced the level of sea scallops, an important fishery. The marine/terrestrial similarities are also reflected in the body condition and health of species, the researchers noted. In Shark Bay, green sea turtles are more willing to face risks from sharks and seek the best grazing areas when their body condition is strong. In like fashion, the common wildebeest on the African Serengeti are less vulnerable to attack by lions or hyenas when their physical condition is good. A more frequent information exchange between terrestrial and marine ecologists could provide additional insights into ecosystem function, the researchers said in their report.